The leaves are turning and the air is crisp. We’re back in the season of Brussels sprouts! I feel like I’ve craved Brussels sprouts since we left Scotland this past May. Unsurprisingly, not a single sprout was found in Spain this summer. I know summer isn’t the season for them, as they are typically harvested from September to March, but after spending two winters in Scotland, I got used to having them around. 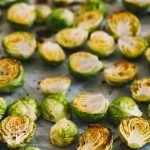 Brussels sprouts are one of my favourite veggies because they taste great and are packed full of nutrition. These tiny cabbages are no doubt healthy, but did you know they’re a good source of Omega-3 fatty acids? I wouldn’t have guessed that since I usually associate Omega-3 with foods higher in fat, namely flaxseeds, chia seeds, and nuts. 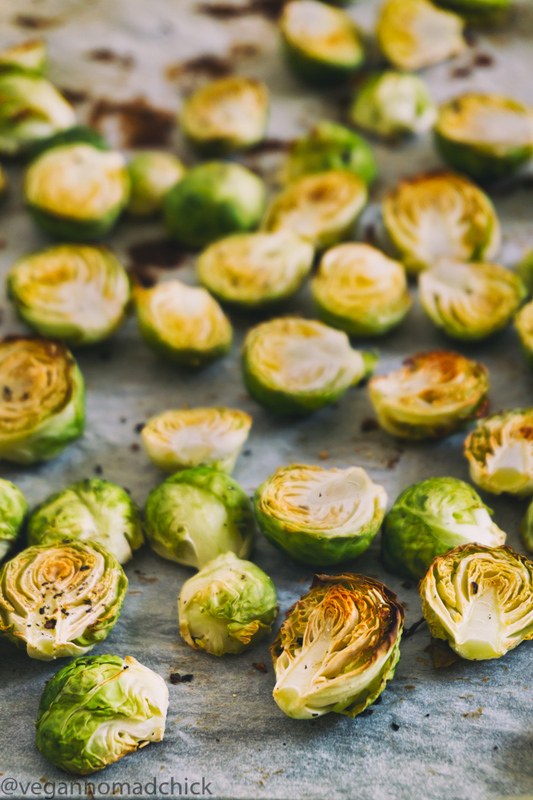 …100 calories’ worth of Brussels sprouts (about 1.5 cups) provide about 480 milligrams of the most basic omega-3 fatty acid (called alpha-linolenic acid, or ALA). That amount is more than one-third of the daily ALA amount recommended by the National Academy of Sciences in the Dietary Reference Intake recommendations, and it’s about half of the ALA contained in one teaspoon of whole flaxseeds. Omega-3 fatty acids are the building blocks for the one of the body’s most effective families of anti-inflammatory messaging molecules. They’re also an excellent source of Vitamin C. One cup of Brussels sprouts provides more Vitamin C than an orange. Not that I need extra encouragement to eat them regularly. I’ve always loved Brussels sprouts: steamed, roasted, even thinly sliced and fried (back in the day). Fresh or frozen, I can’t get enough! Brussels sprouts can be very bitter but I find steamed or roasted ones subtle and delicious. Kuba wasn’t a fan of sprouts before but even he enjoys them roasted. If you haven’t tried them roasted, give this oil-free recipe a try. I recommend baking them at 200℃/400℉ for 30 minutes or so, just until they start to turn golden brown on the edges. I prefer a gentler baking as opposed to roasting them at a high heat until they blacken. This way, the sprouts are basically steamed in the oven, and they turn out soft instead of crispy. And since the sprouts aren’t coated in oil, they will easily burn if left in the oven too long. Feel free to bake them for longer, but make sure you shuffle them around often so they don’t burn. Serve them with rice, atop pasta, or enjoy them on their own. 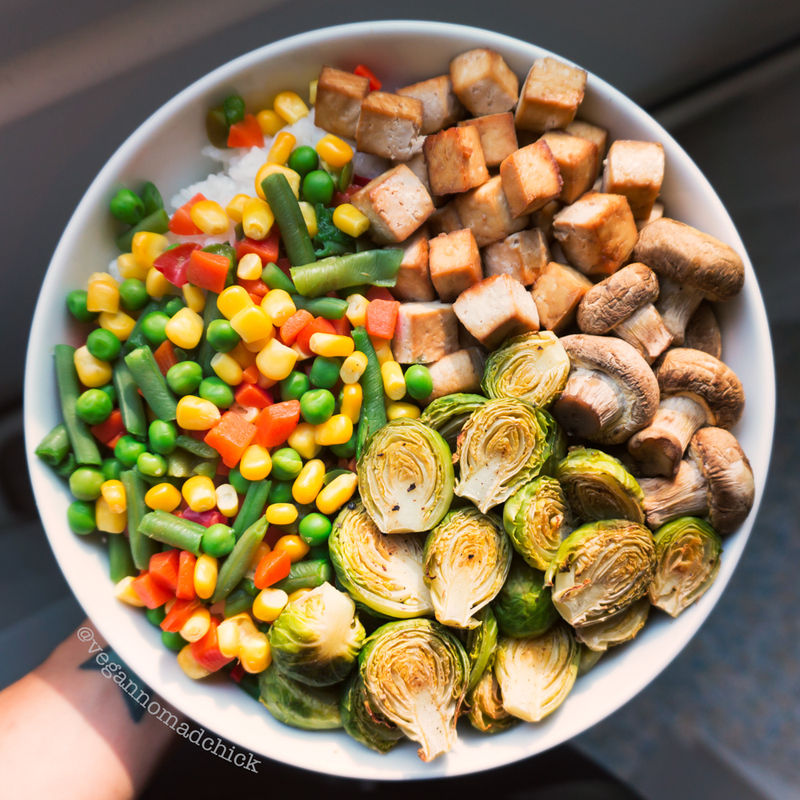 For lunch today we ate around 500 grams (5.5 cups) of Brussels sprouts between the two of us, along with white rice, baked tofu marinated in soy sauce, roasted mushrooms, and boiled frozen veggies. Yum! Do you like Brussels sprouts? What’s your favourite way to eat them? I prefer seasoning these with freshly cracked black pepper. 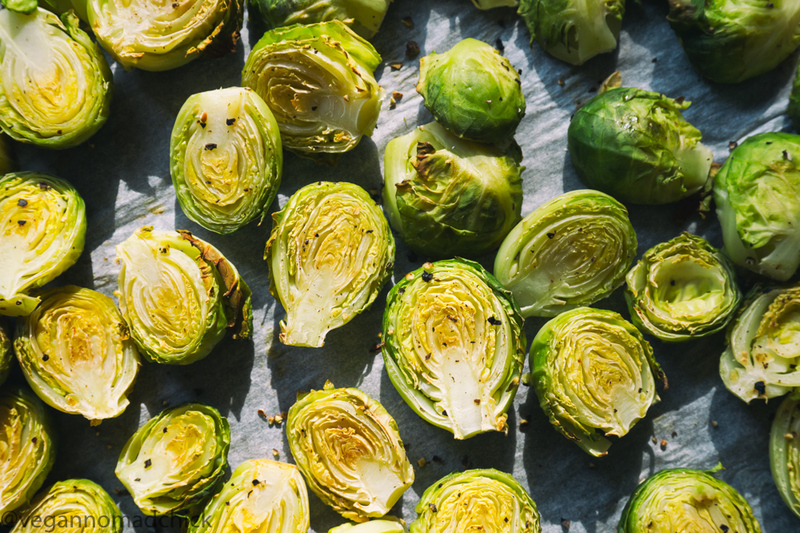 Try any seasoning you like but skip the oil to keep these sprouts a healthy low-fat addition to your meal. Preheat the oven to 200℃/400℉ and line a sheet pan with parchment paper. Set aside and prep your sprouts. Rinse sprouts with water and remove outer leaves if spotty or damaged. Cut the end of the stem off (the little hard nub at the base) and slice in half. Spread them into the pan in an even layer. Sprinkle with black pepper. Bake for 15 minutes at 200℃/400℉. Shuffle them around in the pan and bake for 15 minutes longer or until they soften and start to brown around the edges. Remove from the pan, serve and eat immediately. They're pretty good as leftovers too! One serving (1/2 of the recipe) is approximately 108 calories. Brussels sprouts are very low in calories but high in fibre, making them an excellent side dish. 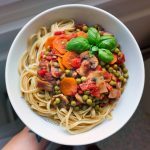 An entire pan full of oil-free sprouts (500 grams) checks in at 215 calories. I never add extra salt to my meals but feel free to salt this sauce to your taste. Keep an eye on your sprouts near the end of the baking time. They will easily burn if left in for too long.